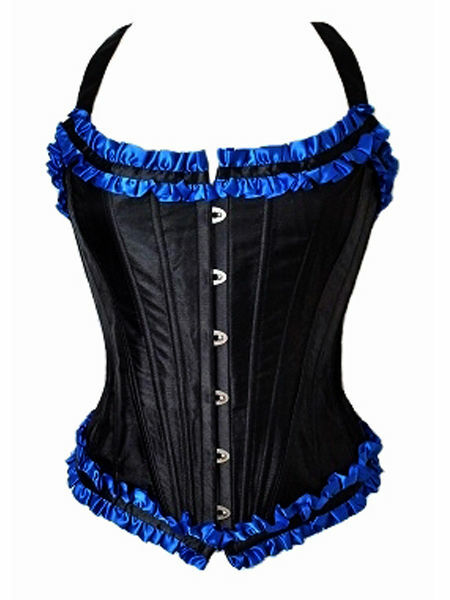 A heavyweight corset with an astounding 24 bones in total, including two flat steel bones at the front busk fastening. 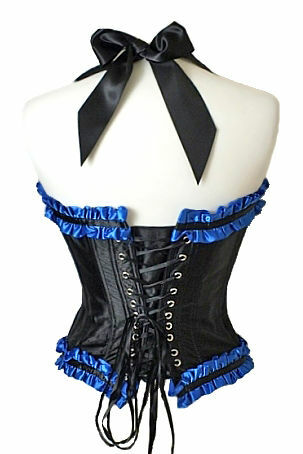 The corset is made from black satin with the upper front and back and lower hems trimmed with royal blue ruffled satin ribbon. The back has metal eyelet and ribbon lacing with a generous modesty panel. The corset has two wide black satin ribbons attached at the front and two at the back which form a halter neck tie. An ideal corset for waist training. The bust and waist measurements below will extend a further 3-4" by adjusting the back lacing. Bust: 28" Waist: 22" Length from underarm to side hem: 13"
Bust: 30" Waist: 24" Length from underarm to side hem: 13"
Bust: 32" Waist: 26" Length from underarm to side hem: 13"
Bust: 34" Waist: 28" Length from underarm to side hem: 14"